Was this generique recorded in Paris or Kinshasa ? Hard to tell. I believe that Piece Rare was recorded between both cities, but Rabbi was probably recorded in Kinshasa. If it wasn't for the drum sound, I'd also think it was done in Paris. Yeah, It can be that it was recorded between both cities. Because it sounds like their isn't wasn't a cohesion between Aime Buanga's atalaku and Theo Mbala & Ocean. And Ocean's animations sometimes sounding strange with those instrumental transitions. But did Lili Nedule passed away around 1996 after she Anti Choc? 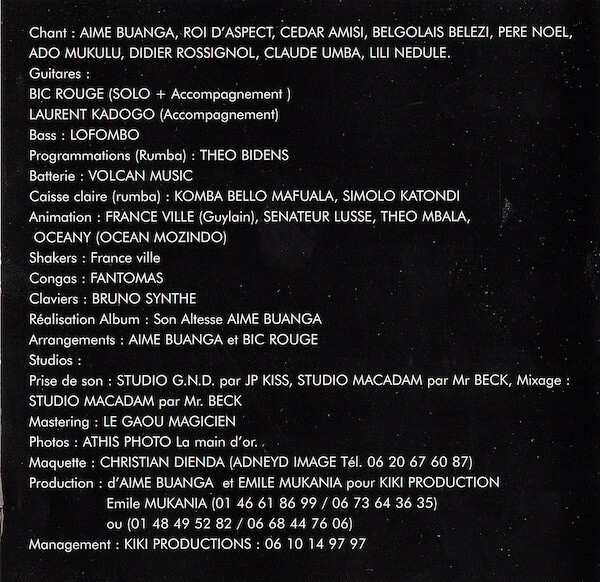 I think that Aime Buanga contacted Theo Mbala & Ocean for his album to get contracts in Francophone West-Africa countries (Benin, Togo, Mali, Guinee, etc.). I don't know. I didn't follow Wenge Kumbela. La carre magique took over. Who even was following Wenge Kumbela around that time? They were like that one underground, niche band buried by a few mainstream artists.